5th Sunday of Lent. March 13, leaves at 6am, returns at midnight. Passes Antigua’s Central Park at 4:30pm. For the online mobile interactive 2016 PROCESSION ROUTE click here. 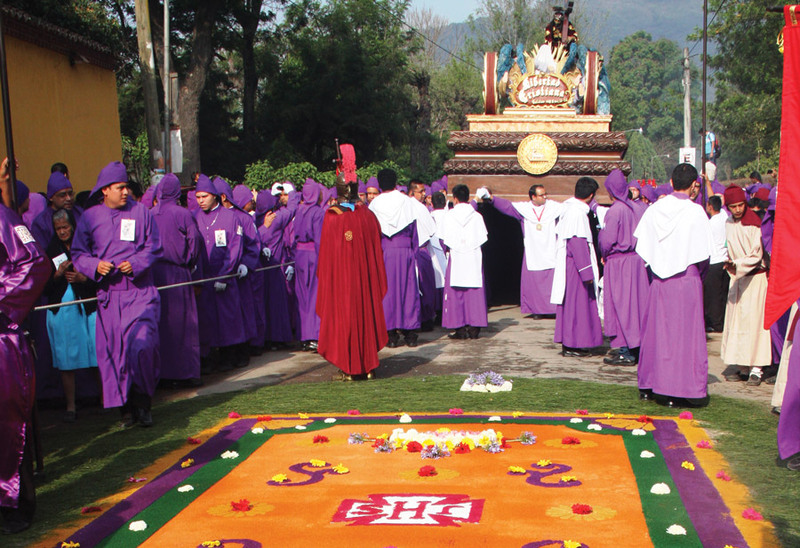 A day of pageantry and devotion. 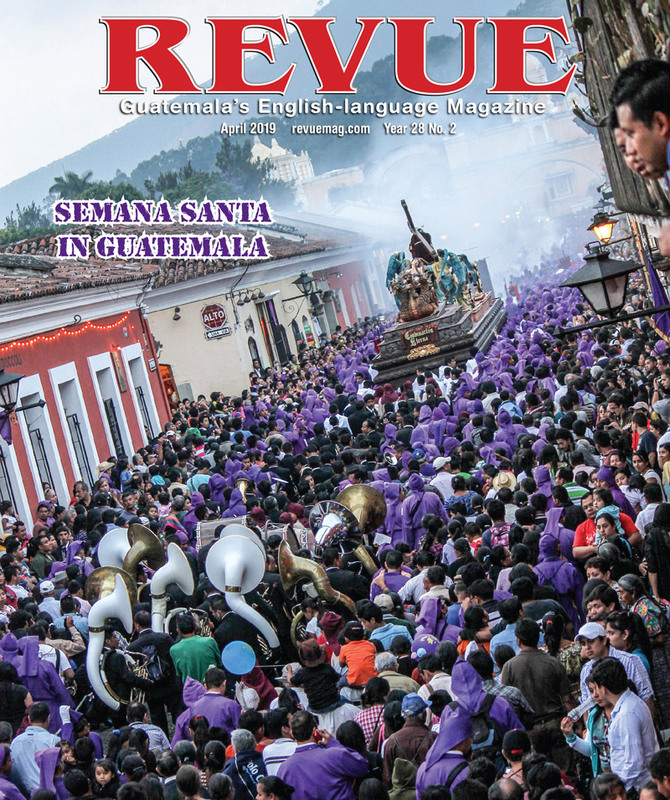 I remember waking at the stroke of 6 last year on the fifth Sunday of Lent in San Bartolo, a charming suburb of La Antigua Guatemala where I was living at the time. World-renowned for its exquisite colonial architecture, Antigua is also host to one of the largest and most elaborate celebrations of Cuaresma or Lent in all of Latin America. 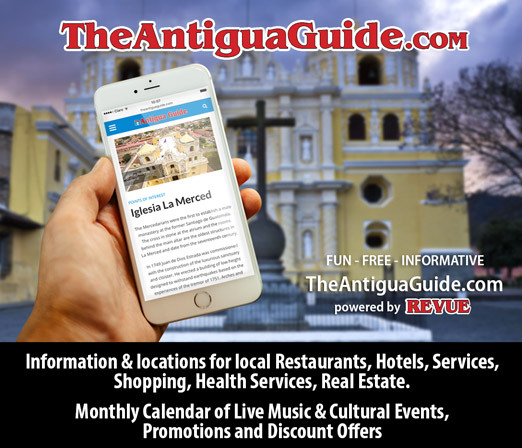 Each Sunday during Lent, and leading up to Semana Santa or Holy Week, several local congregations sponsor religious processions that depart from their church and follow various routes through the streets of Antigua before returning to their parish hours later. Beautiful Alfombra, just five minutes from destruction. The processions, which re-enact Christ’s last days in Jerusalem, are attended by tens of thousands, including throngs of visitors from around the world. Because I had already been in Antigua four years earlier on Good Friday, I had a sense of what to expect. On this magnificent morning, however, as I stepped out from behind a huge wooden gate onto the main carretera, I felt as though I were in a time warp some 2,000 years past. It was like being on the set of a Cecil B. DeMille film. The scene unfolding in front of my apartment complex was simply stunning if not surreal. 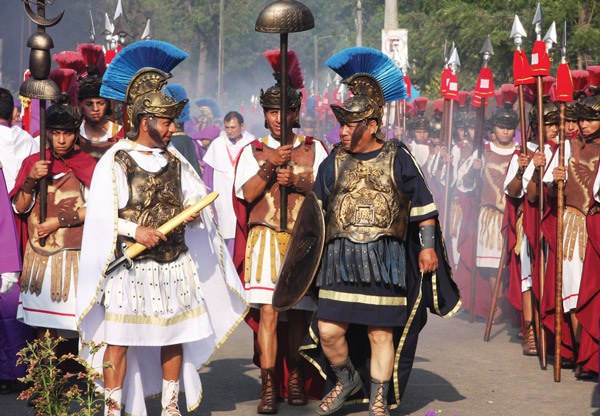 As I made my way through clouds of incense, just 10 feet ahead of me stood an entire Roman army, bearing swords and shields. Some were carrying spears, which can be used to lift electric lines out of the way of the religious statues that are transported on huge hand-carried floats. Street vendors had already started selling delectable breakfast treats, including enchiladas, warm tortillas, beans, rice, grilled meats and sweets. And there was an endless supply of toys and colorful balloons for the children. 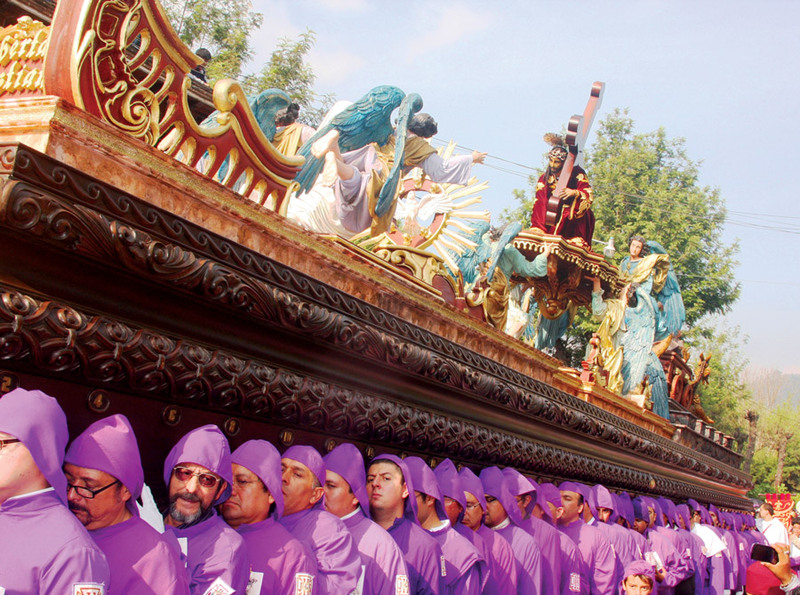 Cucuruchos—men who carry the floats and images during Lent—walked along both sides of the roadway, keeping a path clear for the float and its bearers while ensuring the alfombras remained intact. 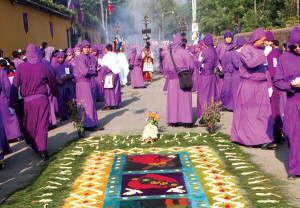 The alfombras or carpets are prepared throughout the processional routes using pine needles, fresh flowers, brilliantly colored sawdust and sand. I had to walk a mile to return to my complex the night before because the streets had already been closed off while locals created their masterpiece alfombras. I chatted with some of the creators and asked one of them how long she had been working on her alfombra. “Four hours,” she replied, and she still had a ways to go. It was 1 a.m. but there was enough time. 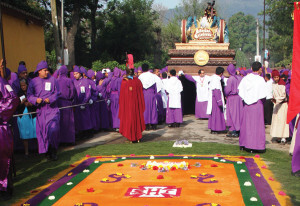 Cucuruchos—men who carry the floats and images during Lent—walked along both sides of the roadway, keeping a path clear for the float and its bearers. 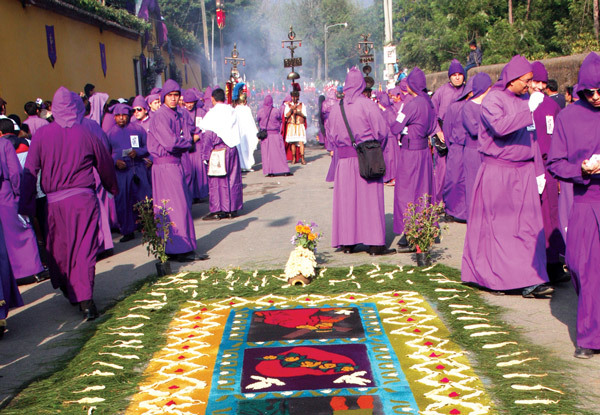 The art of the alfombra is truly ephemeral, an act of pure faith because in a matter of hours, her magnificent work would vanish beneath worshippers’ feet as a huge, hand-carried float bearing the Fallen Christ of San Bartolomé Bercerra crossed over it. Don Gabo, who served as a member of the San Bartolo Hermandad for over 30 years, explained that the image of the Fallen Christ is attributed to sculptor Pedro de Mendoza. Unlike many of the Nazarene images in which Jesus is portrayed in an upright position, the Fallen Christ or Jesús Nazareno de la Caída symbolizes the episodes in which Jesus fell under the weight of the cross on the way to Calvary for his crucifixion. I was in Antigua in 1990 for Semana Santa. It was very beautiful. The sawdust drawings on the streets were exquisite, too bad they had to be destroyed later in the day by the procession. It was a very warm day for Antigua. April seemed like the warmest month of the year.